On Wednesday afternoon, Kanye West continued to draw attention to his Twitter page after posting a selfie wearing a red Make America Great Again hat, one of the widely known symbols donned by President Donald Trump supporters. 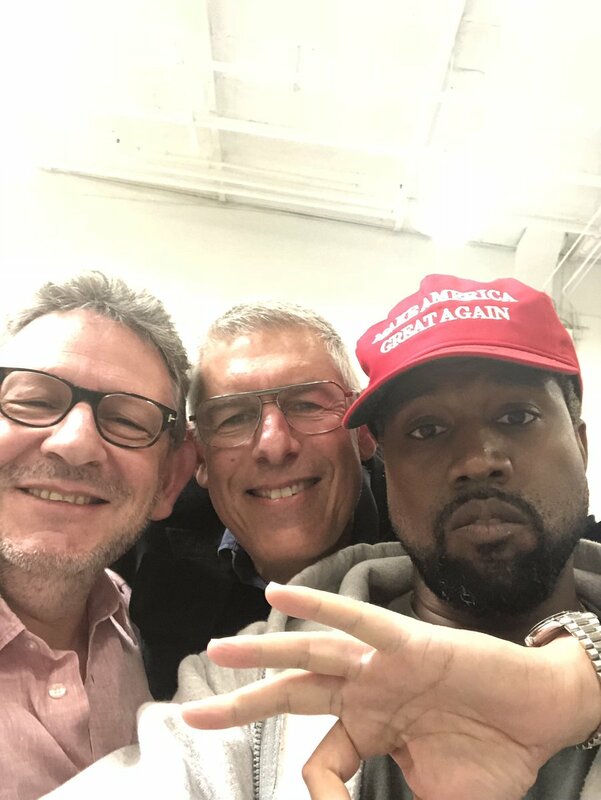 Music industry veteran Lyor Cohen, YouTube’s head of global music, who signed Jay-Z back in the 1990s, was next to him throwing up an OK sign, which has become a symbol for the alt-right. To complete this trio selfie, Lucian Grainge, chairman and chief executive officer of Universal Music Group, was smiling ear to ear. Cohen issued a statement to Spin through his spokesperson Wednesday evening about the photo but did not get into his specific views on politics. Kanye has left a paper trail of clues that he was a friend and supporter of Trump. He visited Trump Tower and posed in photos next to the president in New York City in 2016. On Saturday, he also tweeted that “he loves” the way Trump supporter and commentator Candace Owens thinks. As for Cohen and Grainge, their support for Trump or any support of the alt-right’s ideologies has not been apparent and still isn’t known. However, it’s likely that questions for both men will arise over the next several days about their political beliefs. Both men are tied to initiatives helping people of color, for whom Trump has often targeted with racist hate speech. Supporting Trump would certainly be seen as counterproductive to work both men have done within those communities. Cohen has been very engaged and instrumental in black cultural institutions, especially in hip-hop. During the 1980s, Cohen helped sign legendary acts such as Jazzy Jeff & the Fresh Prince and Slick Rick to Def Jam. His tenure at Def Jam lasted from 1988 until 1998, and he ultimately became president of the label. Later, he became president of Island Def Jam music group, a conglomerate of labels that included Def Jam. In 2004, he left to be CEO and president of Warner Music Group. Cohen is also on the board of directors of the Boys and Girls Harbor, an organization that serves primarily black children in Harlem, New York City. After Jay-Z’s former business partner Dame Dash in 2014 accused Cohen of being a “culture vulture” who makes money off of hip-hop culture without giving back, Cohen cited his work with the organization. As far as Grainge, he has not publicly supported Trump or spoken on his political views in the past. However, he has pushed social responsibility efforts at his company UMG. Last fall, UMG became the first music company to partner with the University of Southern California’s Annenberg Inclusion Initiative. Grainge has not made a public response to Kanye’s photo yet. But we will update this post if he does respond.